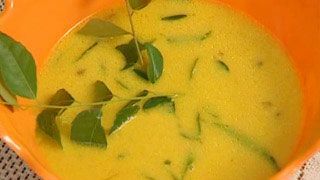 In a pressure cooker, cook dal with required amount of water till you hear 3 whistles. Let it cool. Now add salt and turmeric powder and mix well. To this add fine paste of coconut, cumin seeds, garlic and curry leaves. Mix it well and let it boil. Add 2 tsp of coconut oil and remove from the flame.